The latest macOS 10.14.3 Mojave Final Update (Build # 18D109) has been released for Mac devices by Apple. The newest macOS 10.14.3 Update is not a major update in terms of new features and functions, instead it focuses more towards bugs fixes, security, and performance improvement and stability. So yes, if you are macOS user and facing any kind of issue with your old macOS 10.14.2 software version, then you can upgrade your system without any hesitation. Apple has also releases macOS Server 5.8 Beta and Xcode 10.2 Beta updates for developers and programmers and to general public Apple has also released the latest version of iTunes i.e. v12.8.2 for Mac and v12.9.3 for Windows. Safari v12.0.3 and iCloud 7.10 has also been upgraded to latest builds. 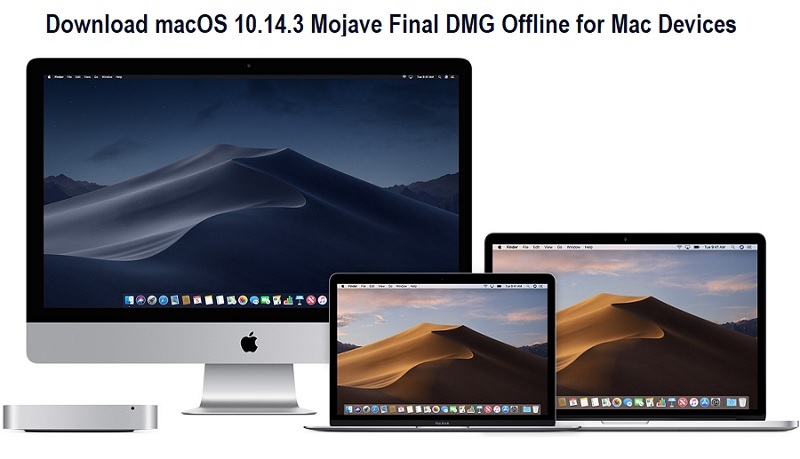 Mac users can free Download macOS Mojave 10.14.3 DMG Combo, Delta and Offline Installer for manual installation without app store on multiple devices through direct links available below. As i mentioned before, the latest macOS 10.14.3 Update is the minor update which offers fixes and improvements to Mac system, so if you have any issue with your existing operating system, then you can update to this version freely to experience new changes. How to Install macOS 10.14.3 Offline Without App Store? If you want to get the latest macOS 10.14.3 Final Version directly from Apple, then you can go to this option; App Store >> Software Update. Otherwise you can free download and install macOS 10.14.3 final update without app store on multiple Mac devices through direct official links available below.